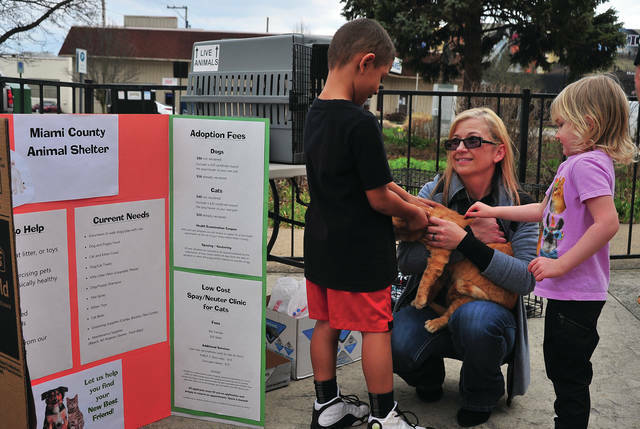 Miami County Animal Shelter Manager Kandice Kriebel, center, introduces Curtis Burns, Jr., 6, and Arya Wheeler, 4, of Troy, to one of the many animals available for adoption through the shelter, during a Saturday fund-raising event at 311 Draft House in Piqua. PIQUA — The Miami County Animal Shelter along with the local “Beer Thinkers” — also known as Cheryl and Jim Burkhardt and Kazy and Joe Hinds — hosted a pet meet and greet prior to an annual a beer-tasting fundraiser at 311 Drafthouse on Saturday. “We want to raise awareness on the need to adopt animals,” Cheryl Burkhardt, one of the organizers, said on Saturday. She said that there are good, adoptable pets available locally at the animal shelter. Director Kandice Kriebel of the animal shelter brought with her a cat and two dogs, including Ross, a terrier mix, and Rosie, a 10-year-old shepherd mix. She said that Rosie came to the shelter injured and required surgery to get back in good health. “Now she’s ready to find that forever home,” Kriebel said. Kriebel talked with visitors about getting the adoption process started and also about their low cost spay/neuter clinic for cats. The animal shelter has also partnered with the Upper Valley Career Center to spay and neuter animals before they are adopted. Thanks to that new partnership, five dogs and four cats have been spayed or neutered, and of those animals, two dogs and all four cats have been adopted. “It’s something we just started,” Kriebel said. The shelter continuously looks for resources to help place shelter animals into their forever homes through adoption. The Beer Thinkers team’s fifth annual beer-tasting fundraiser followed the pet meet and greet with all of the proceeds benefiting the animal shelter. The event sold out all of their 60 tickets for $30 each in under 24 hours, Burkhardt said. She added that they may hold another beer-tasting fundraiser again this year in the fall. “We have a ball planning them,” Burkhardt said. The event paired beer- and food-tasting with music, all of which part of a different theme each year to coordinate with their chosen charity. In years past, their themes included fun titles such as “Beer, Beatles & Chocolate,” “Sinners and Saints,” and “Motown Magic.” Those fundraisers have benefited organizations like the Piqua Compassion Network and CISV Miami County. This year’s theme is “Yappy Hour with Mews and Brews.” Burkhardt said one example is BrewDog’s Elvis Juice, which they paired with Elvis Presely’s “Hound Dog” song. One of the other beers featured in this year’s tasting will be the Last Chance IPA from Weyerbacher Brewing Company. Weyerbacher’s logo sports an animal paw print designed with hops, and they donate a portion of their proceeds from the Last Chance beer to local animal rescue organizations that offer adoptable pets their last chance at a forever home.